Average time to complete this WHMIS e-Learning program is approximately 45 minutes. This WHMIS e-Learning program is self-paced. Participants may pause/leave the online training program at any time and can resume where they left off. Created specifically for those in Canadian workplaces who have already had some training on the basic concepts of the Workplace Hazardous Materials Information System (WHMIS), this training program allows participants to quickly refresh their WHMIS understanding. Participants will review WHMIS basics and Canadian legislation, hazard classes, labels and material safety data sheets (MSDSs) and learn key tips for working safely with hazardous materials. 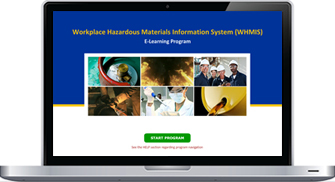 Developed by HR Proactive Inc., this WHMIS e-Learning program features built-in review quizzes. Those who score at least 80% on the final exam will be able to print a certificate of completion. HR Proactive Inc. can also host your own customized training centre portal with HR Proactive’s suite of compliance e-Learning programs. Call for information about the various options available for purchasing WHMIS suite of products at Toll Free 1.888.552.1155.